Spring Creek Dental provides all phases of implant dentistry so your treatment will not require visits to multiple doctors. Dr. Joel Kaines has successfully completed the special training required to surgically place implants. Dr. Kaines has been placing dental implants with excellent results in Fort Collins since 2005. Several factors might make you a good candidate for dental implants. Dental implants are the best way to replace missing teeth, to improve chewing, speech and digestion, to support a denture, and to restore a patient’s confident smile. 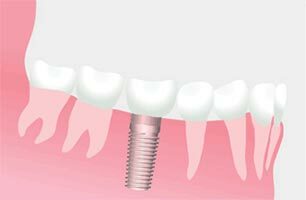 Dental implants offer a fixed solution to having removable partial dentures or complete dentures. Implants also deliver excellent support and stability for these dental appliances should you need them. Don’t I Need to See a Specialist for Dental Implants? Sometimes. If your case is particularly complex, or if you have diabetes or other major health concerns, Dr. Kaines would refer you to a specialist. However, general dentists with special training like Dr. Kaines are fully qualified to surgically place and restore dental implants with the same high quality results. With ten years of comprehensive experience with dental implants, Dr. Kaines can meet your dental implant needs with confidence. You could pay an additional $1,500 or more to see a specialist, but in many cases, this is unnecessary. Dental implants are artificial roots and teeth, usually made of titanium, that are surgically placed into the upper or lower jaw bone by a general dentist or dental specialist. The teeth attached to implants are natural looking and often enhance both function and appearance for patients. 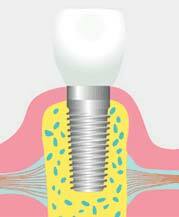 Dental implants are very strong and stable. They will last many years, but sometimes require replacement due to normal wear. The surgical placement of dental implants requires a number of visits to Dr. Kaines at Spring Creek Dental over a period of several months. Your dental professional will take X-rays and impressions (molds) of the jaw and teeth to determine bone and gum tissue health as well as spacing available for a dental implant. While the area is numb, the implant will be surgically placed into the bone, then allowed to heal and integrate itself into the bone for up to six months. Depending on the health of the bone, a second surgery may be required to place the “post” that will hold the artificial tooth in place. With other implants, the post and anchor are already attached, and are placed at the same time. After several weeks of healing, the artificial teeth are fabricated and fitted to the post portion of the anchor. Because several fittings may be required, this step may take one to two months to complete. After a healing period, the artificial teeth are securely attached to the implant, providing excellent stability and comfort to the patient. Visit Dr. Kaines at Spring Creek Dental for a complimentary implant evaluation. Dr. Kaines will discuss with you whether you are a good candidate for replacing missing teeth with dental implants. Spring Creek Dental can deliver an excellent result in the convenience of our Fort Collins office. Call (970) 482-8883 to schedule an appointment with our compassionate, professional staff at Spring Creek Dental today.